It’s common for devotees to feel unqualified or unworthy to serve guru and Krsna. This is helpful when it is a natural symptom of spiritual advancement. But it is detrimental when, out of an unhealthy psychology, we either feel unworthy of receiving Krsna’s grace, or feel unworthy of being loved by Krsna. Spiritual unworthiness and material unworthiness are not the same. One is a by-product of a high level of Krsna consciousness and the other is a symptom of an unhealthy mental or emotional state. Is it possible for conditioned souls to develop healthy feeling of unworthiness? If so, what would this look like? And how do we know when those feelings are not Krsna conscious but signs of an emotional weakness or problem? We look at these and similar questions in this newsletter. It is an elementary understanding of Krsna consciousness that this world is a perverted reflection of the spiritual world. We learn that qualities and characteristics that are undesirable (such as jealousy, anger, sulking, envy, etc.) have their pure “all-good” spiritual counterparts. What may look like a material defect, or even a mental or emotional illness, can be a symptom of an elevated state of Krsna consciousness. Thus, we sometimes see advanced devotees exhibiting extreme lamentation, self-denigration or hopelessness as aspects of their Krsna consciousness. How are we to relate to this? Can we follow in their footsteps? Is there a kind of lamentation, self-denigration, and hopelessness that’s suitable to our level of Krsna consciousness? If there is, how can we not become discouraged by such feelings? Feelings of unworthiness have their place in our lives, and can inspire us if these feelings are genuine and appropriate to our level of Krsna consciousness. To come to a level of feeling genuine spiritual unworthiness, we first need to overcome our material feelings of unworthiness. Why? Because these material feelings are not healthy for our bhakti. Let us first look at feelings of unworthiness that are detrimental to our advancement. Devotees often feel unworthy to receive Krsna’s mercy, kindness, and love, feeling that Krsna is throwing pearls to a swine. More often than not, such feelings are mixed with, or result from, a material sense of unworthiness (I am bad, I am dirty, I am foolish, I am…). So let’s first understand that the Lord doesn’t exactly see us as we may see ourselves. Everybody, by Mahaprabhu’s mercy, is worthy of Krsna’s love and thus worthy to become Krsna conscious. How did we all become worthy? What did we do? Actually, we didn’t do anything. All we did was exist. By being a spirit soul (which obviously doesn’t take any doing on our part), we are qualified for the Lord’s mercy. Mahaprabhu’s love is so great that every living being is an object of His affection. Indeed, it is not possible for Him to not love us. Despite all this, Krsna always cares about us. How do we know? If He didn’t care about us, then why would He empower His holy name with prema (i.e. why does he give away prema through his holy Name)? If Krsna didn’t want a relationship with us, why did He send so many of His eternal associates to come to this world to bring us back to Him, despite our faults and disqualifications to engage in His service? If Krsna didn’t love us, why did He send Srila Prabhupada to go out of his way to save us from our material lives and offer us a one-way ticket to the spiritual world? This is just a fragment of the evidence that shows how much Krsna cares about every one of us. There is nothing we can do, aside from continued blasphemy of, or willing disobedience to Krsna’s pure devotees that would make us unworthy of Krsna’s love. Still, even if we believe we are truly unworthy, this makes us even more qualified to receive His mercy. Just as being poor qualifies one to receive welfare from the government, disqualification is the very cause of being worthy of the Lord’s mercy. If Mahaprabhu were selling love of Krsna for the price of qualification, He would have closed His shop long ago having gone out of business for lack of customers. Abnormal feelings of unworthiness can be caused by being (or feeling) unloved or denigrated by others, or by personal failures in life. In this unhealthy state, we can feel ourselves so low, impure, unintelligent, or unqualified, that even God couldn’t find a reason to love us. Prabhupada explained that if you cut your finger, you try to save it. You don’t say to the doctor, “Just let my finger fall off, I have nine other fingers.” Similarly, Krsna doesn’t think, “I have so many other devotees, so who cares about you?” He doesn’t think like this because everyone is dear to Krsna. 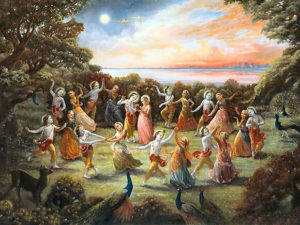 Visvanatha Chakravarti Thakura describes that every living entity has a unique relationship with Krsna, and thus Krsna experiences unique pleasure from every individual relationship. In other words, Krsna relishes a unique taste from His relationship with every one of us. This means He is anxious to taste that specific rasa with each of us. Not only that, He has a unique way of reciprocating with each one of us; a unique taste that He offers to each and every relationship. So it’s not that Krsna is ambivalent about us. He very much wants a relationship with us, so much so that He is actively trying to get us back into that relationship. The problem is not that Krsna doesn’t care about the relationship; the difficulty only comes when we don’t care enough about the relationship. This means the problem is not that Krsna feels we are unworthy of a relationship; the problem is we don’t feel worthy of the relationship. If somebody gives us a gift, we might feel unworthy of accepting it, but out of respect, and to reciprocate affection, we accept the gift nonetheless. After all, it would be rude not to accept someone’s expression of love for us because we feel unworthy of it. Similarly, Krsna gives us the gift of Himself in His holy name, in the spiritual master, in the sanga of devotees, in His temples, through his arca murti – in so many ways – and it is a rejection of His affection to say, “No, I am not going to accept these gifts because I am not worthy of them.” If we did say that, Krsna would reply, “It doesn’t matter that you are not qualified. I am giving you Myself. Being worthy isn’t My criteria. I give Myself to you, not because you are worthy, but because I love you. “So it’s not a question of whether or not we are worthy. It comes down to receiving Krsna’s love. We are all very busy in the material world doing millions of things that ultimately amount to nothing more than preparing our next birth. In other words, we tend to be expert at “putzing around.” Have you ever been in a rush to make an appointment and you call for one of your family members to get in the car, but they are holding you up by being busy doing nothing of much consequence? In the same way Krsna is calling us to leave this world because we are “putzing around” here, doing a million unimportant things that amount only to holding Him up. This is how we should also think. Thoughts of being worthy or not are simply getting in the way of the real fact that Krsna is waiting for us. Do You Want To Dance With Krsna? Krsna is waiting to dance with us. What fools we are to make excuses not to join the dance? Similarly, when reading Srila Prabhupada’s purports, behind the words you can feel Prabhupada showering love and compassion. Of course, the message of the purport is there, but behind the message allow yourself to feel the love that Srila Prabhupada has for you and me, and all conditioned souls. Prabhupada’s love for us is further evidence of Krsna’s love for us. Prabhupada is a messenger of Krsna’s love, and thus he loves us all without discrimination. Prabhupada loves everyone to such a degree that he never rejects anyone, no matter how fallen, who is willing to serve Krsna. Still, as stated earlier, there are proper feelings of unworthiness appropriate to our level of advancement. These feelings are both natural and helpful for bhakti. So what are these natural feelings for neophyte devotees and how do they manifest? Feelings of unworthiness manifest in two prominent ways in the stage of vaidhi sadhana bhakti: appreciation and humility. Appreciation manifests in gratitude that Krsna accepts us and our service despite our past sins and present faults as long as we simply make a sincere effort to serve Him and Srila Prabhupada. Even though unqualified, Krsna mercifully gives us lots of service. As we meditate on how Krsna allows us, even though unqualified, to be engaged in His service, our appreciation for Him and the service He gives us grows. Thus, feelings of unworthiness help us see our service as a precious gift that we are blessed to have. Feeling unworthy also makes us feel helpless. Taken in the correct way, helplessness is a manifestation of humility in accordance with our present level of Krsna consciousness. It manifests as a total dependence on Krsna for guidance, intelligence, and ability to do our service well – or sometimes even to do our service at all. It is through this kind of humility that we advance rapidly in Krsna consciousness. Thus, feelings of unworthiness, when exhibited in a Krsna conscious sense, become one of our greatest allies in sadhana bhakti, because humility is integral to advancing in Krsna consciousness. So yes, we should feel unworthy. We don’t deserve Krsna’s love. We are not qualified to even be a devotee. We have turned our back on Krsna, we have competed with Him, we have disobeyed Him, and we have even tried to become like Him. Still, Krsna overlooks all of this and forgives us. His desire for a relationship with us is so strong that He will not allow any of this to get in the way. As Krsna will not allow our own disqualifications to get in the way, we should also never allow our own disqualifications to get in our way. Rather, we should allow our feelings of unworthiness to bring us closer and closer to Krsna. This is what Krsna wants us to do. Yes, Krsna does miss us. Let’s stop putzing around. Krsna is waiting for us.